For our second to last comic, this is the point in which our trip with Tiggs and Tina begins to diverge from reality. Well... I think it had back when we said Japan used SAM sites on our drone. But hey. The trip to Japan was incredible. Ron being that guy who plans world trips down to each individual footstep and, literally, recites the previous and next step of the plan every ten minutes just to see how it sounds... And me being the guy who recently discovered other countries existed and that the lore of Fallout wasn't based on a true story. All in all, Ron was babysitting me the whole way. I figured the least I could do was be a quiet and patient baby while writing down the jokes that would become this little mini comic series. We wanted to do something together and I figured a fun travel-log with our two favorite tigresses would be the way to go. I'm also very happy some of you liked my pictures! To think Ron was actually apologizing to me along the way too. Apologizing that I'd "have" to wait on a beach for thirty minutes while he set up a drone and got some of the coolest movie footage I'd ever seen. He'd apologize to me saying he's sorry that I'd have to wait on the grounds of an incredible feudal castle or at the feet of the closest thing I'd ever get to a real giant robot while he got a tiny bit of time to himself. I was trying to write this post with new pictures and content... But really, I've spent enough time gushing about Takoyaki. The time in Japan gave me a chance to cool off during a really rough time in my life. Everything was genuinely collapsing around me and I was losing relevance on a day to day basis. But Ron was there for me. Ron cared, said he still wanted to go, he'd plan the whole trip out, help me find hotels, book those hotels, map out the entire footpath of everywhere he had trail-blazed personally years prior, and then went out there and did it all again... Just so we could have a good time and make a few films. You don't find friends like that anymore. So instead of gushing about a particular location or food, I'd like to gush about my friend who really made 2015 a year to remember for me. Thanks Ron. I hope you get everything you deserve out of life. You're great. Wow, that was really nice of you man. I'm really glad you enjoyed the trip! I had a great time, and it was a ton of fun making this comic series. It was a wonderful idea, and I'm glad it came out as it did. It was great traveling with someone; I had been to Japan twice by myself, and to be honest, on the second run I was starting to get a bit bored towards the end (to the point I was not considering going again). Don't get me wrong, exploring is fun, but it's a lot more fun when you have someone along for the ride! I'm hoping we can do it again sometime, I convinced SK to get a visa for Brazil, and although that trip fell though on our first attempt I'm looking forward to giving it another go in the near future. Who knows? Perhaps there will be a Tora Tora sequel in the future? This comic really makes me want to go to Japan for a vacation now. What an amazing experience. It was nature at the end that won the food. I am so glad you guys had so much fun on that trip, and I'm grateful that you both decided to share it with us in this amazing little comic. Thank you, so much!! We didn't really make a comic about it, but we also had fun trying all sorts of variations of Okinomiaki. 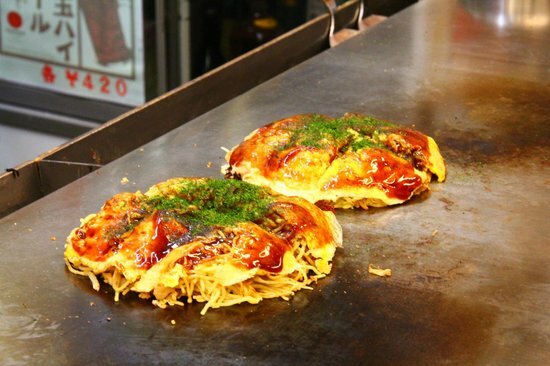 There are many ways to make it, and several regions of Japan have their own twist on it. 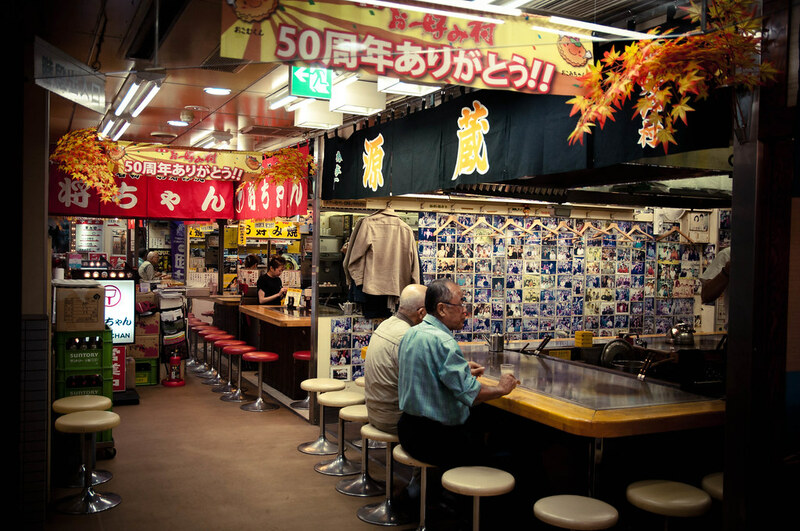 Imagine if you will, a 4 story building packed full of small okinomiaki restaurants, all with about 10-15 seats a piece. You can't really go wrong when choosing one; they all are good! Friendship and food can never go wrong. I learned that when I spent 5 years in a row going to a Native American pow-wow with people I had met in chat rooms. We all camped out together, everyone bringing little bits of cooking others had never tried before and had so much fun. With this comic, and all the anime I've been watching, I'm kinda feeling like I might get adventurous like that again, some day. Actually, I'm not one for Sushi normally, but some of that stuff has been really mothwatering. But goodness gracious! That looks delicious!!! Also, I just now realized that this is near the end. How will Tina and Tiggs exact their revenge against that rat with wings? In that case, it's time to call in GHOST DRONE! The only thing better than going on an awesome trip: going on an awesome trip with an awesome friend... especially when it involves adorably aggressive deer and Aperture Gladbuses. That bird is a true villanous mastermind... Tiggs & Tina may have met their arch-nemisis for TTT-2: Judgement Day.